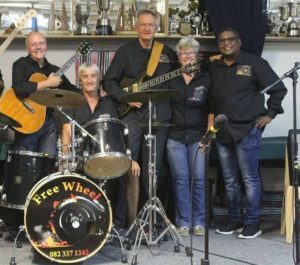 Al’s Place is excited to be hosting ‘Free Wheel Band‘ for the third time on Saturday 24 March. They will be performing favourites going all the way back to the sixties. The playlist will include many popular artists and bands such as the Rolling Stones, Henrique Iglesias, Eric Clapton, The Hollies, Dire Straits, Doobie Brothers, Queen, Brian Adams, Bon Jovi, Joe Cocker, Billy Idol, Chris Isak, Robert Palmer, Van Morrison, R.E.M. and many more. The band consists of Oscar Otto (lead vocals), Grant Nuss (bass guitar, vocals), Les Kloot (lead guitar, guitar synth, backing vocals), Derek Botes (drums) and Cheryl Cox (keyboard). Contact and address info here. View their music repertoire here.